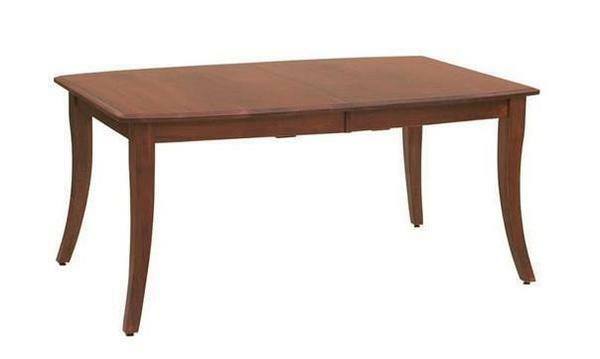 The Concord Dining Room Table features gently outward curving legs and a sleek, traditional table top design. This gorgeous Amish handcrafted table fully exemplifies the beauty of quality hardwoods. The table shines simply because of the flawless craftsmanship and the materials, and does not cover up any material defects with over ornamentation. This table is inspected multiple times during the build-process to ensure no material or workmanship related defects go unnoticed. The resulting piece is of heirloom quality, and cannot be replicated by imported furniture mass produced on assembly lines! Each handcrafted table from DutchCrafters is truly one-of-a-kind. Furthermore, the Concord Dining Table is made in America in a little woodworking town in Pennsylvania! Feel free to contact DutchCrafters with any questions at 1-866-272-6773. I can't tell you how AMAZED I am at the quality of my new dining room furniture. The pictures online can't do it justice! Absolutely beautiful furniture! Gary and his 2 man crew were incredible...kept me updated and arrived early no less. They did a fantastic job of bringing the table and chairs in and setting it all up. They definitely are the best in the business. Can't go wrong with this company as they are everything they advertise and more. I will definitely be ordering more next year to finish out my home. These furniture pieces are heirloom quality. Thank you so very much for the beautiful furniture.